yeah so what i havn't posted for what---half a year or something ( i got so many posts under my sleeve right now you will all be CRUSHED by my blogging! JUST YOU WAIT!!! but, well, actually the real truth is that i forgot my password and couldn't find it. seriously. i know, it's sad.). 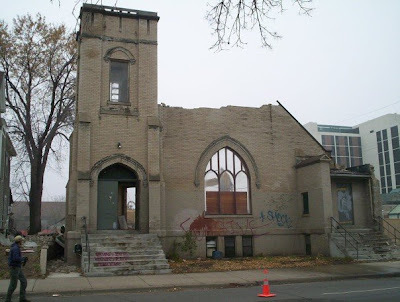 just heard word that today the Church was bulldozed into its grave. sad, sad thing. the church was (for those of you not a) a resident of minneapolis or b) a wingnut who enjoys really fucked-up music performed in strange spaces of dubious legality) a place where, for a great many number of years, truly weird stuff went down. mostly bands/ shows etc that couldn't (or didn't want to be) pulled off in a more "legitimate" setting. folks lived there, too. i swear i remember going to a show there in 1991, and when the cops came to bust it up i escaped in a wheelchair i found. in the past decade or so, i havn't been a regular denizen of the place as much, but from time to time i've had some truly awesome/ scary musical experiences there. the first Destijl Festival, the last time i saw Wolf Eyes (ended in a near riot...some meathead smashed whathisname's table w/ all his noise thingies on it...ugly. ), and the final show/party a couple months back, which was absolutely one of the most absurd clusterfucks i have ever had the privilege of being witness to ( i bailed at 3am, and there were still 4 BANDS LEFT TO PLAY.). i could go on and on about how places like this are few and far between and yadda yadda yadda. but really, shutting up and saying 26th and chicago ain't what it used to be is all i got at present.